It is our delight to provide the following information about our pastor so you can become better acquainted with him. 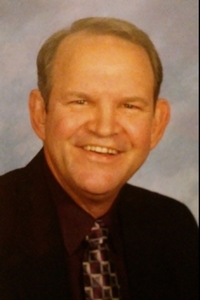 Bro Terry has been the pastor of First Baptist Church for 23 years. He accepted the call to be our pastor in April of 1995. His commitment is to lead our church family to be a Bible-believing, Bible-living church and bring God the glory by fulfilling His ministry purpose of preaching "the whole counsel of God” by going verse-by-verse through Books of the Bible. Pastor Terry has a visible love for God, for His Word, and for shepherding His people. His heart’s desire is to preach and teach the Word of God so that people will not only learn the Word, but more importantly, be able to live by God's Word through the power of the Holy Spirit. Pastor Terry was raised in a Christian home, and God used his parents lives and teaching and the ministyr of their local church family to draw him to Christ, open his eyes to see and his heart to understand that he was a sinner, unable to save himself. He trusted the finished work of Christ and had the joy of accepting Christ as his Savior when he was seven years old. As he grew in the faith and knowledge of his Lord and Savior Jesus Christ, God developed his faith and sharpened his focus and led Him to a call to serve him through a pastor-teacher ministry. Pastor Terry met his beloved wife, Kay, in college and they have been married for 44 years. She is his best friend, prayer and ministry partner, love of his life, and soulmate. Kay is a true woman of God ,devoting her life to her family and serving her Lord in the home, through the Music and Bible Study ministry of the church, and in her community via friendships and service projects. Pastor Terry and Kay have four beautiful daughters: Cathy (who went to be with the Lord in 2010), Stacy, Lindsay, and Ashley (who went to be with the Lord in 2008). They also have been blessed with three grandchildren: Draden, MaKayla, and Anthony who they are very proud of. The Lord opened the door for Brother Terry to receive his Bachelor's degree from Southwest Baptist University, his Master’s degree from Southwestern Baptist Theological Seminary, and his Doctor of Ministry degree from Luther Rice Seminary. Dr. Davis had been blessed to pastor four other churches in Iowa,Illinois, and Missouri prior to coming to FBC, Butler. Pastor Terry is thankful that God continues to allow him to serve Him and build a Christ-centered and Biblically-based local church ministry that reaches out across the street and around the world. Dr. Davis hearts desire in that his ministry will bring glory and honor of God. He seeks to be faithful to lead and feed the flock of God and knows that God will work to build His church. 1 Samuel 12:23-24, "Moreover, as for me, God forbid that I should sin aginst the LORD in ceasing to pray for you; but I will teach you the good and the right way. Only fear the LORD and serve Him in truth wiht all your heart; for consider how great thingsHe has done for you." Some things Pastor Terry enjoys doing in his free time are: (1) Spending time with his wife and family; (2) Working in his flower and vegetable gardens; (3) reading; and (4) travelling to and exploring interesting places. Pastor Terry and our staff would love to meet you. If you would like to grow in your faith and be a part of a local ministry that is making an eternal difference First Baptist has a variety of ways to help you grow deeper in your faith & closer in community with other believers.